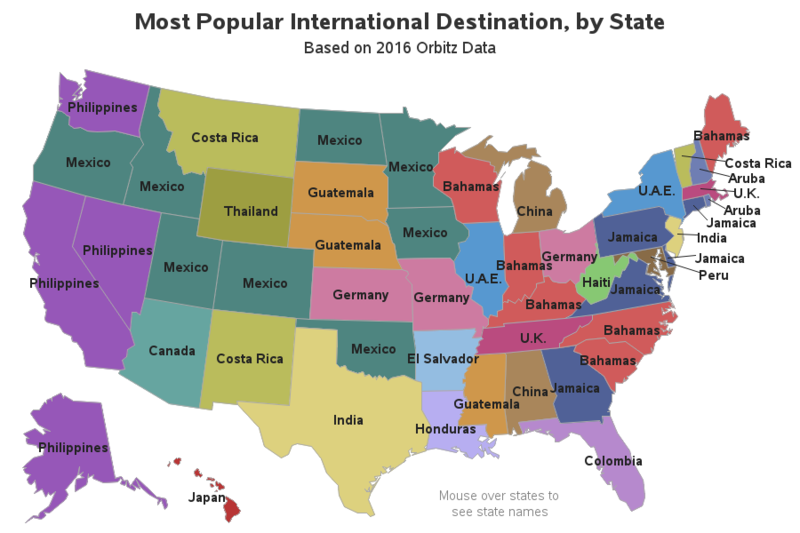 Orbitz recently published a map showing the most popular international travel destination for each of the 50 US states. 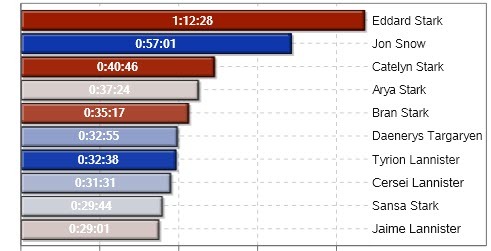 It was an interesting map ... but of course, me being the Graph Guy, I had to pick it apart and create my own version. Follow along, and explore this interesting data, while also learning some data-mapping tips! Here's the original map that caught my eye. 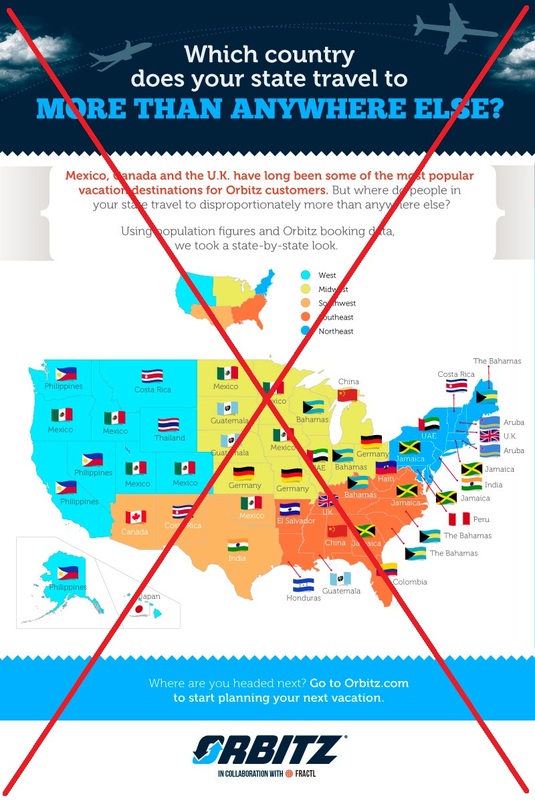 The map was prominently colored by US region ... but region had nothing to do with the travel data that the map was trying to convey. It wasn't easy for me to recognize the country flags, and it was difficult to read the small country labels beside each map. It was difficult to know exactly what this data represented, because the titles and explanatory text were a bit wordy, and split into different sections above the map. The region colors on the map competed with the country flags, for my visual attention. And although I'm pretty good with world geography, I'm embarrassed to admit, I wasn't sure exactly where some of these destination countries were located. So I set about creating a SAS dataset of the information in their map, so I could create my own map. 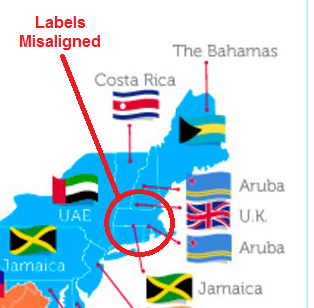 In doing that, I found one additional problem - some of their labels didn't align properly with the states (see the ones circled in red below). For example, the label for Massachusetts is pointing to New Hampshire. And now the big (fun) question ... Why?!? 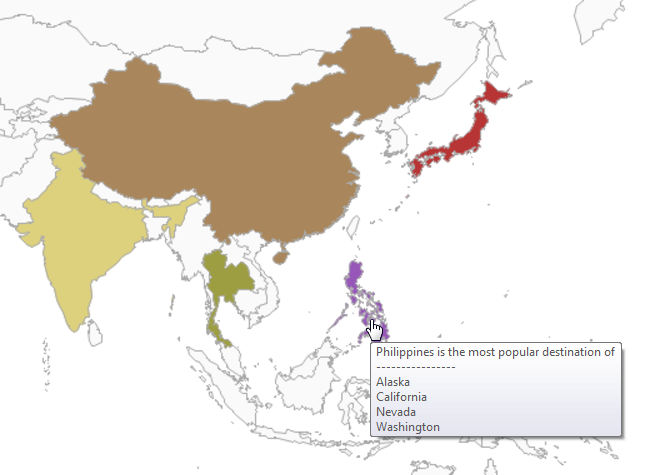 Why are certain countries the most popular destination from certain states? Feel free to leave comments with your theories on this topic! Good revision of the original map! That said, the original map info says they used "population figures and Orbitz booking data." That actually adds more confusion to the question. Populaiton figures? Are the destinations somehow correlated to state population? Huh. Yes, the UAE probably represents folks who are flying on Emirates to connect to other destinations. 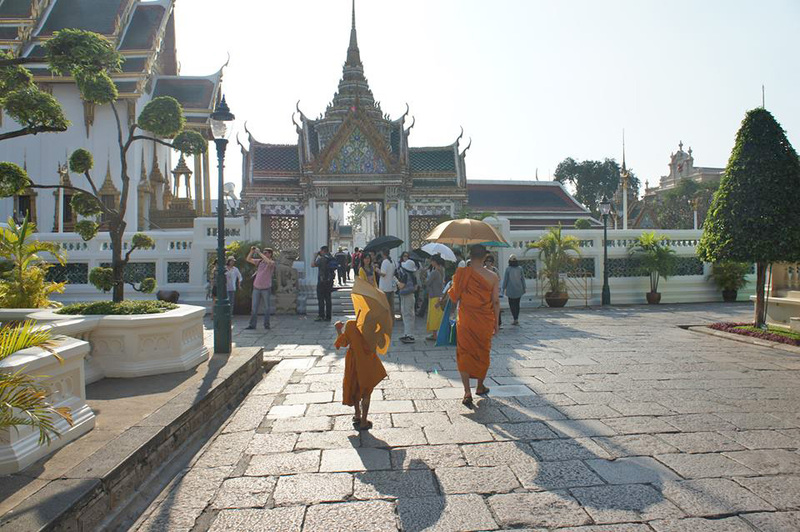 The Caribbean destinations like Jamaica, Aruba, and the Bahamas probably represent leisure travelers originating in the USA, while the Canadian snowbirds in Arizona are making their seasonal migration north. The Philippines and the Central American destination countries represent immigrants in the USA returning to visit family in those countries. I believe the airlines use data from the US DOT for their planning purposes, which includes the final destination in the itineraries (maybe called form 1A, or something like that). I wonder if some destinations aren't final? This is fascinating - a map that inspires more curiosity! Whether or not these are final destinations is key - from my local airport the only US destination I can fly to direct is Orlando so very often when I've flown to the US it's been just as quick and no more expensive to fly to Paris or Schipol in the Netherlands, change planes and fly direct to, say, Washington or Seattle than it would be to travel the 130+ miles to Heathrow by train and fly direct. This is really cool! Thanks for posting!